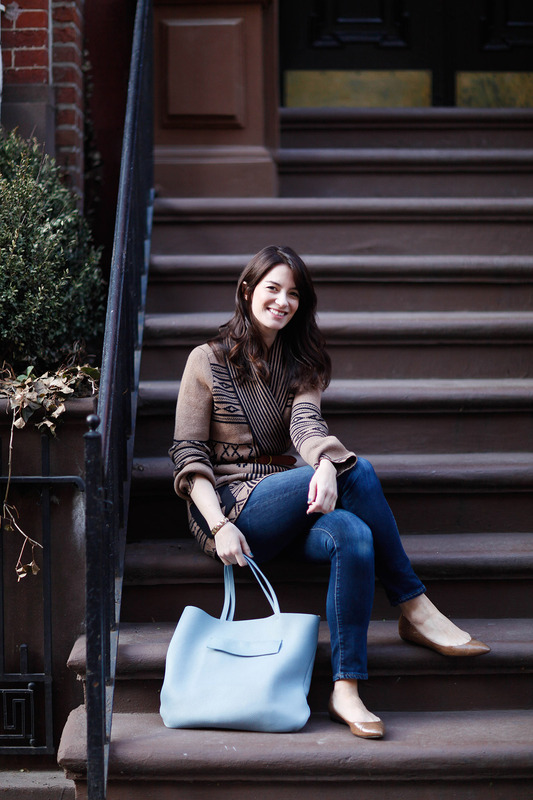 Next in our series is Alisa – a Senior Digital Strategist at Small Girls PR, in New York City. Alisa teamed up with photographer Christina Emilie to snap some of her favorite work outfits, while strolling through the West Village. Here she describes her favorite easy dress up or down basic, a new trench for sweater weather, and her go-to “I-rolled-out-of-bed-too-late-but-want-to-look-put-together” outfit. I’m a Senior Digital Strategist at Small Girls PR, where I handle everything from influencer and brand partnerships to multi-platform public relations campaigns in the digital/tech, fashion, and design space. We work with a bunch of cool up-and-coming startups, like Rebelmouse, Threadflip, HelloFlo, and Lumoid, to more established Fortune 500 companies, like GE and Ann Taylor. How would you describe your philosophy / style? My style is a bit eclectic—I love vintage, feminine pieces but I’m also drawn to the 1960’s mod, Twiggy era. Lately, I’ve been really into shibori prints, mudcloth, macramé, and wabi-sabi. I like when things are a little imperfect and not overly fussy. Annie Hall, Jean Seberg, and Jane Birkin are such timeless style icons. In terms of contemporary ladies, I really admire Sofia Coppola, Zooey Deschanel, Carey Mulligan, and Rashida Jones, and Instagrammers like A Vintage Vice, Bethany Marie Olson, Alyssa Coscarelli, Lauren Caruso, Lucy Laucht, and Rachel Antonoff—all have enviable style, and most importantly, look like they’re having fun. What item(s) in your wardrobe could you not live without? I can’t live without my Moscot sunglasses, ever-expanding collection of Baggu’s (perfect for hauling groceries, flowers–you name it), and a beat-up, old pair of Ancient Greek sandals that are the most comfortable shoes I own. Oh, and dresses/rompers. It’s nice to have one item you can just put on and go. How did you put this outfit together / what was the thinking behind it? I probably wear this dress way too often, but it’s such an easy basic that can be dressed up or dressed down. 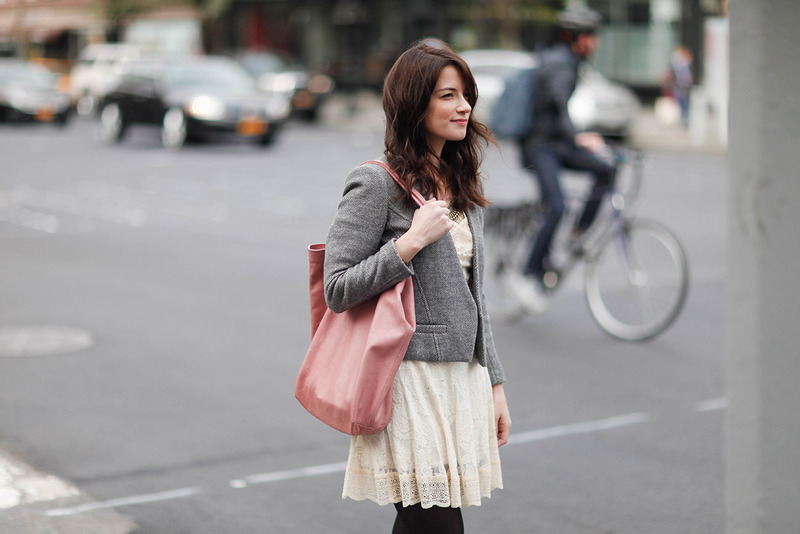 The color combo of gray, white, and pink. Where did the pieces come from? This is my “I-rolled-out-of-bed-too-late-but-want-to-look-put-together” outfit. I’m a big believer in waist-cinching belts. They’re universally flattering! The contrast of light blue with camel + geometric prints. I love the bright, geometric print of this dress from Pinky Otto, and the navy trench helps tie it together. I’ve been wearing it over everything lately, now that’s its finally starting to warm up in New York. It reminds me of crisp fall days and sweater weather. Nothing beats fall in New York. Thank you, Alisa, for allowing us to commute alongside you to work and get a glimpse into how you put together your outfits! I love your eclectic, vintage, feminine-but-not-too-fussy style. It is effortlessly chic! For more advice–style and otherwise–from women who are on the brink, follow @shespoised on twitter, or like She’s Poised on Facebook (and select Get Notifications from the drop down menu). P.S. Dressing for work on a budget, in praise of the black jumpsuit, and selecting a signature scent.